Cooper Landing, Alaska is one of the premier fishing destinations in the world. The small town of several hundred residents is located on beautiful Kenai Lake and the beginning of the world famous Kenai River. Cooper Landing is a great place to stay for your “Base Camp” to the Kenai Peninsula as you experience all of your adventures. 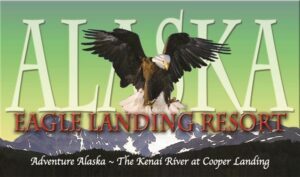 Eagle Landing Resort is located just south of Anchorage, a short 1 hour 45 minutes drive through one of the most scenic areas Alaska has to offer. Cooper Landing has many hiking trails at various levels so that all can participate. Here at Eagle Landing you can simply sit on the bank of the River and watch the many drift boats and scenic raft trips go by as you watch eagles soaring overhead. We are also only an hour drive to Seward where you and your group can visit the Sea Life Center, take a Kenai Fjords National Park tour, where wildlife viewing is abundant, or book a day for Halibut fishing.